How are you maintaining over the Holidays, Peeps? Ready for a new year? I”m ready, yes I am. But I can’t say I’m running away from 2014. 2014 has been very good to me, all in all, and I’m grateful. I like to take this week between Christmas and New Year’s to say good-bye to the past year and to focus on some aspirations for the next year. Notice, I don’t say “resolutions.” I think aspirations are enough. Get a good focus at the starting gate of a new year. But before aspiring, I like to revisit the year that is leaving …I plan to squeeze out all the experiences from 2014 that I possibly can. Drink 2014 down to the dregs. 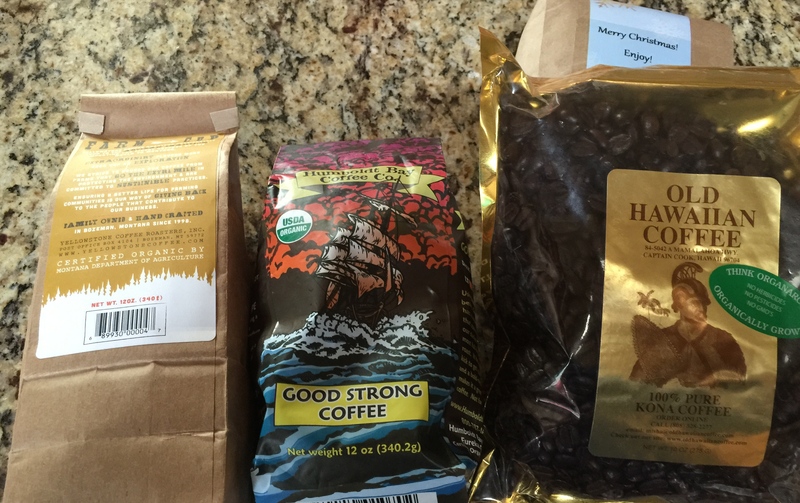 Speaking of which, Mr. Al and I received four bags of coffee this year for Christmas from four different sources. Which I decided to take as a sign and to make coffee the old fashioned way…grinding the beans and putting them into a French press to steep for four minutes in nearly boiling water. Then I add a little cream and a little maple sugar and voila! Magnificent Morning Coffee. One of my aspirations for next year is to really take notice of the moment. And take the time to make something well, like a good cuppa jo. Actually appreciate myself enough to take the time. 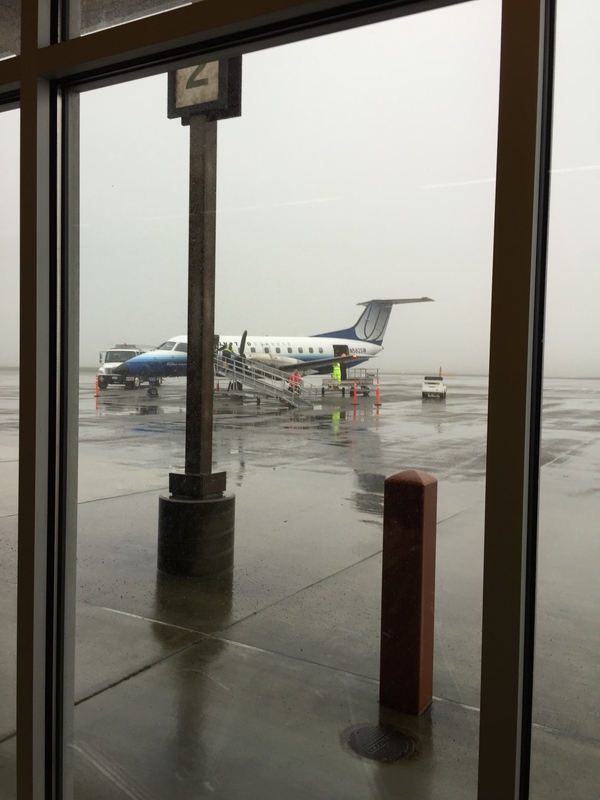 (Here’s a picture of my plane which landed in the fog after the second attempt. The flight personnel gave the pilot a high five. He deserved much more than that. Man’s got some skills, landing in fog like that. …Mr. Al had put up the track lightening in my writing/studio space. No more dodging around the low hanging pool table chandelier the previous owners had left. I’ve now the perfect space for lingering over creating something new. I leave you with a beautiful glass piece I saw at the SeaTac airport created by Williams Morris, the glass artist who decided he’d done enough of that and retired in his 50s to go play at other things. The world was devastated. I was disappointed as well, but why? It’s his life to live as he pleases. His work is beautiful and soul satisfying. I thank him for that. I’m curious to see what he does next. Maybe it won’t be creating. Maybe it will be absorbing life. 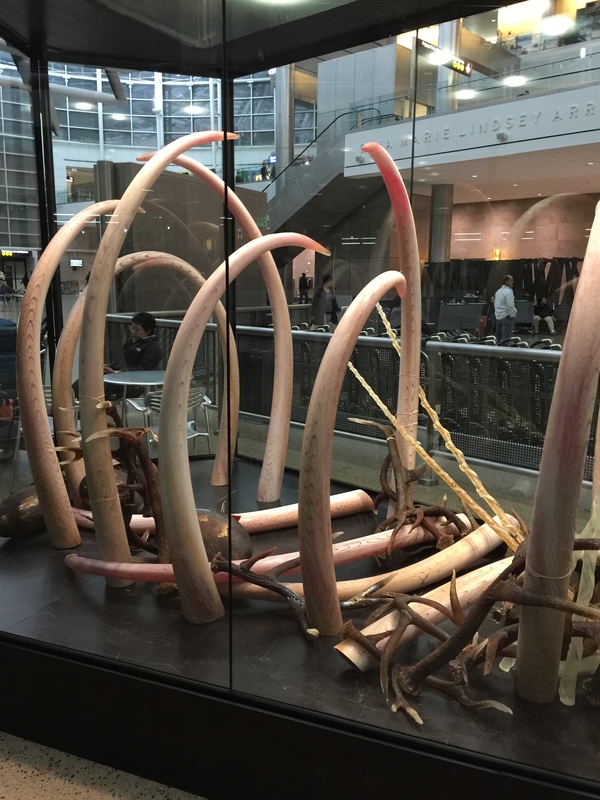 And here’s the piece at SeaTac…Had it not been late at night I may not have noticed it. 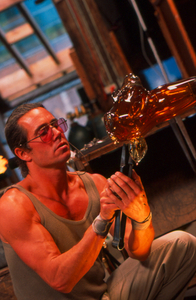 Can you believe that that is all created from glass?? Exquisite. HAPPY NEW YEAR, PEEPS!!! Be safe. Have fun. See you next year. If you’re going to go for the whole early morning ritual thing, as I did, you have GOT to get at least one bag of this coffee. It’s the best I’ve ever tasted, and I have searched far and wide. It’s better than dark chocolate, I swear!!! And remember me every time you wake yourself up with the fragrance of grinding beans and that first nectar-like sip. And what a gorgeous hunk is our William Morris. And a fascinating, varied, manly man.